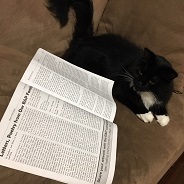 Our next event will be our every-other-month letterwriting night at Somar Bar on Monday, February 27, 6:30-8:30pm (1727 Telegraph in Oakland). We will have letters to stuff to send inside to 185 of our members, so join us even if you aren’t wanting to penpal. Details/RSVP here. And save the date for March 22 – still awaiting venue confirmation, but that should be the date of our March letterwriting night. Not at Somar, but also in Oakland. We’ll be scheduling another mail processing night soon, as we’ll be needing to data entry all the forms we get back from our 185 incarcerated members without bios. Date tbd. We will be back at Somar Bar for our letterwriting nights on the following Mondays: April 17, June 19. We are organizing ongoing prison visits to our locally incarcerated members!! If you have a penpal and are interested in visiting them, request that they send you a visitation form and then send that form directly into the prison. We can assist, if needed. Be in touch if you are interested in joining. We have visited Mule Creek State Prison twice so far together and will hopefully be doing another carpool there on April 8 to visit a couple members. We are getting visits scheduled for San Quentin (2/25 or 3/5 and then maybe again in a month or so). We are working on getting clearance forms and scheduling visits for California Medical Facility, CCWF, and potentially CSP-Sac. We are getting started locally on a zine project and a live recording project. If your penpal is a poet or artist, and might want to be involved, get in touch. Generally, Black & Pink members decide individually if they have the capacity/resources to send money inside to penpals. However, we have a small grant and are able to offer $20-30 for up to five free world penpals to send to their penpals commissary or to use to buy snacks during prison visits. This would ideally be for free world folks who wouldn’t otherwise have access to the resources to do this. Every Tuesday: Support TGI Justice Project with sending in legal and self-help resources – get updates here. 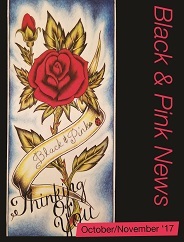 August 4-6: Black & Pink Second National Gathering in Chicago. Come together and celebrate, heal, and organize! We will have a weekend that kicks off with a big party followed by a day of workshops and healing arts and closing out with a day of developing a stong strategy for our organization to use fo the years to come. 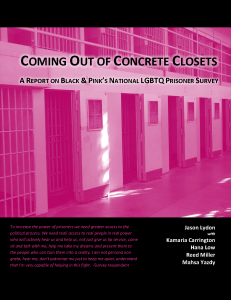 This gathering is intended for ALL formerly incarcerated LGBTQ and/or HIV+ people, any Black and Pink volunteers, all Black and Pink chapter members, donors to Black and Pink, and those interested in the future of Black and Pink’s work. Some events will be exlusively for formerly incarcerated people.